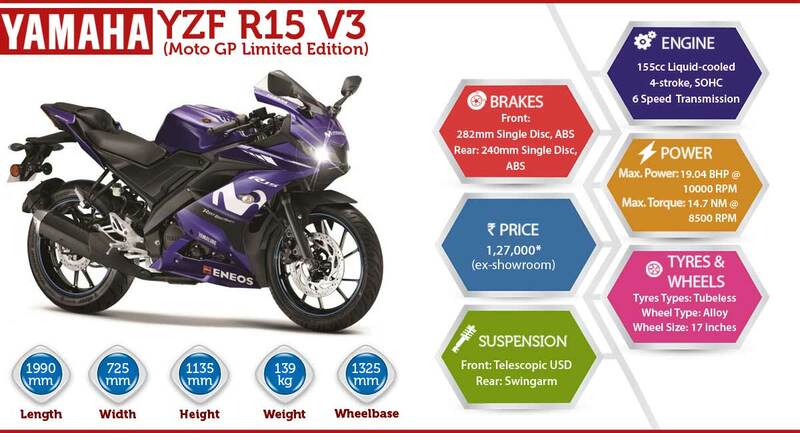 Yamaha has launched the Moto GP edition of its entry-level sports tourer, the YZF R15 V30 in India. Going to produced in a limited count of just 5000 units, the Moto GP edition is put on sale at the asking price of INR 1.3 lakhs ex-showroom. It is aesthetically different from the regular model. It wears blue livery inspired from Moto GP motorcycle, the YZR-M1 and decals of popular brands like the Movistar, Yamalube and the Eneos on the body. It gets power from the same 155cc liquid-cooled engine of the ongoing model.